When you struggle to sleep, or you simply want to snuggle up and create the ideal environment for a restful night, Heath & Heather's nighttime blend will help you unwind. The carefully selected blend of camomile flowers combined with fruits and spices calms your mind, quietens the senses and signals your body to start winding down for sleep. Directions Place the filter bag in a cup or in a warmed pot (one per person). Add boiling water. Leave for 5 minutes to bring out the full flavour. 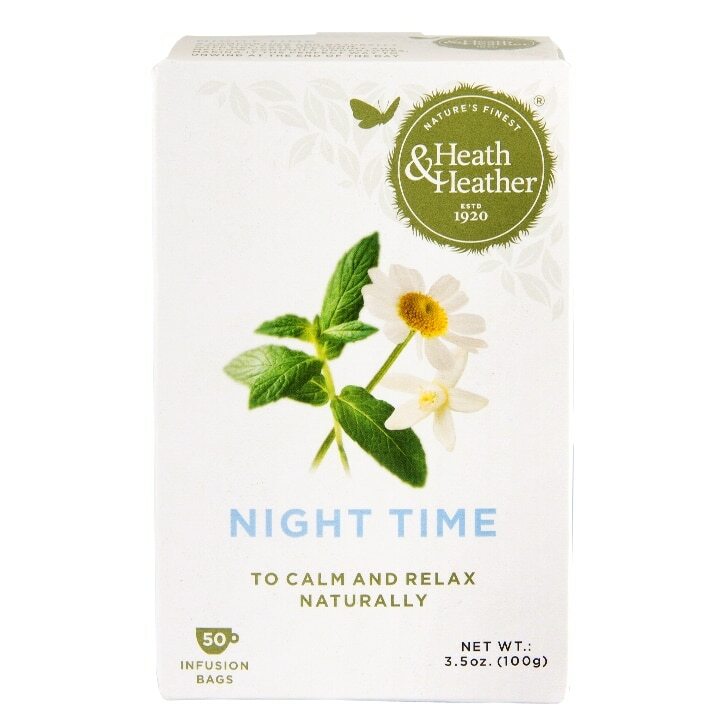 Heath & Heather Night Time Herbal Infusions is rated 4.7 out of 5 by 31. Rated 5 out of 5 by Rosie61 from Heath and heather night time tea It really is the best night time tea, works a treat. You can feel yourself nodding off after about 20/30 minutes after taking it. Rated 4 out of 5 by Dh70 from Great Product Pleasant taste and relaxing. May buy these again after trying others. Rated 5 out of 5 by SPO1950 from Ideal. You drift off to sleep in a beautiful, serene way. Highly recommended. Rated 5 out of 5 by lynb from Mellow flavours... Extremely pleased with my purchase of the Night time tea bags, lovely soft minty flavour and I get a good nights sleep. Can't recommend them enough. Great service and arrived in good time. Rated 5 out of 5 by GrannyTeresa from Calming, relaxing and delicious Since we have found Night Time tea it has become an essential part of our evening routine. We even take it with us if we go away to friends or abroad on holiday. We don't like to be without it! Have tried many other brands but there is nothing like this one. Flavoursome, calming and relaxing. Thank you. Rated 5 out of 5 by Karen 1961 from great little wind down very refreshing tea good last thing at night to wind down after a hard day.